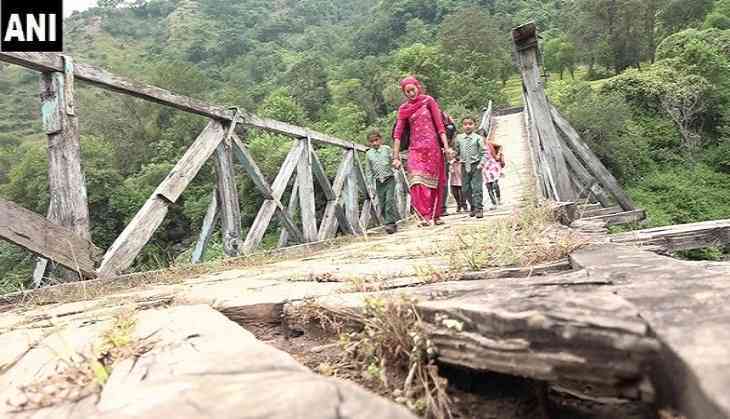 A suspended wooden bridge over river Tawi in Udhampur district's Ramnagar is in a dilapidated condition due to heavy rainfall, with locals risking lives while crossing the bridge. The extreme weather conditions prevailing in the region are adding to the woes of locals in the area, for whom crossing the bridge occupies a large part of the commute. "The wooden planks are broken, it's dangerous to cross the bridge," a local said. However, Udhampur Deputy Commissioner (DC) Ravinder Kumar said the bridge, which has been damaged due to torrential rains in the region, will be restored immediately. Several people were killed and roads were blocked after heavy rains lashed parts of Jammu and Kashmir. Five people of a family were killed after a house collapsed due to a landslide in Gandoh area of Doda district on Monday.